Latimer House's collage aesthetic of Joseph Cornell boxes meets Magritte's surrealism on this sleeve makes perfect sense for the sound they're after on this latest single, "Birdcage Walk" from their own Honk Records imprint. They're taking instrumentation and styles from across era's, cutting them up and rearranging them into something completely new but still familiar. All with the emphasis on the highest quality pure refined POP. If it aint catchy, if it isn't in service to this melody then it don't belong here. 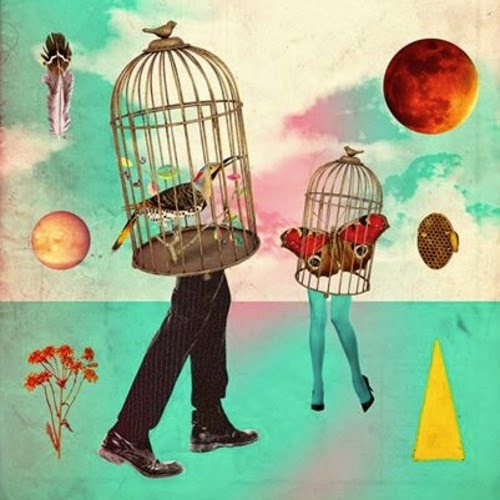 "Birdcage Walk (radio edit)" fires the dense pop up with lots of space, a tight gated jangle guitar and crisp percussion. A hammond juts in with Joe on vocals reminding me of the cool pop smirk of Bearsuit or Prinzhorn Dance School with loads more harmony. They're always playing with effects like the huge delay at the end of this vocal but with an ease and simplicity of capital P.O.P that s impossible to ignore. They have a clear solid core foundation that they play with in every possible way like layering in a mandolin strum once per measure but that drum and bass combo isn't letting you get away very easily either. They're able to make this sound easy without ever sounding juvenile - like Belle and Sebastian, there's expert songwriting at work that constantly is aware of that bigger picture. I turn to Latimer House when I'm looking for that kind of sunny outlook without the distortion or hiss. Tracks like this you can nicely turn up and all your hearing is an instrument, it's kind of a nice change actually. They've kept things clean and extra precise so all those surrealist pieces fall together in surprising ways. "Until Then", an unreleased track, messes with a sharp, hard beat from a harsh kit, the snare cutting back and forth with high hat tics and a bendy almost slide warm distortion. Joe is right in the front with a tin can telephone looking for an opening in the mix of guitars swiping in both directions. This section all drops out into a swirling piece of smooth psych, joining that original beat back again with a brass section. You can hear how excited they are about trying all these elements, like Ween they get off on the complexity and the tiny precision of post production and their never ending search for those perfect sounds for each single instrument. Not that they have to be sonically perfect but they have to be the one for this song. From muted trumpet to putting a mic on the kick drum pedal itself. A great metal dobro makes an appearance and Joe's still got that talking delivery as if any more melody simply wouldn't fit in this song. They have to be multitalented or know an amazing amount of musicians to pull this sort of thing off and I think they probably have both. Get this from the band direct at their bandcamp page on clear red vinyl.